Martina holds a degree (MA in Educational studies at the University of Cologne) and trained with Philippe Gaulier (theatre) and Monika Pagneux (movement) in Paris. In the mid-80s she performed as an actor/ musician in the renowned Kölner Stunksitzung (Cologne cabaret) and toured her native Germany with the devised musical “Eine Messerspitze Liebe” as part of the ensemble Gatschek’s Freunde. Martina had an acting role in the French/ German co-production film Transit by René Allio (starring Sebastian Koch) in 1989. She was a dubbing actress in La Grande Cabriole, TV film by Nina Compagnes and a dialogue speaker on French radio in Vocable (German/ French program). 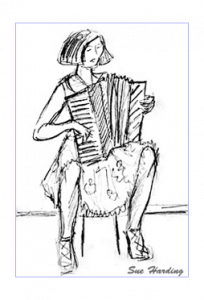 Martina taught herself the accordion in her early teens and picked it up again when living in Paris in the late 80ies. There she also took lessons with Phillippe Piquot and her repertoire of French chansons grew quickly, a genre she has been fond of since her teens. Her playing over- and underground in Paris led to more interesting musical theatre work and she started to recognise and nurture the composer in her. Meeting an Englishman in Paris brought Martina finally to London where she achieved a teacher’s diploma (LTCL) in music education at Trinity College London. She has been based in London since 1990. 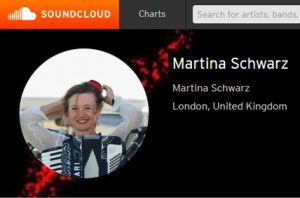 Martina loves the variety of her work. She is passionate about writing music for theatre and film, enjoys all gigs, whether solo, within duo Bow and Bellows , with 4 piece band Palavah or in other musical formations. She enjoys arranging songs and teaching them to her community choir as much as enchanting children all over the globe with her catchy language learning songs or watching patients’ faces lighting up when performing in hospitals and day centres. Music is such a magic communicator and healer! Green Candle Dance Company, Protein Dance, First Framework, London Bubble Theatre, The New Factory of the Eccentric Actor, Shared Experience, Music in Hospitals, Vital Arts, the South Bank Centre, ENO Baylis, Stanley Hall Opera, Théâtre sans Frontières, Freshwater Theatre Company. Apart from playing solo Martina currently performs with the versatile duo Bow & Bellows, in 4-5 piece band Palavah, occasionally with “Les Moineaux de Paris” and in the Chalk Circle Collective. She is currently collaborating with One Moment in Time Theatre company and keeps touring her language learning songs worldwide. 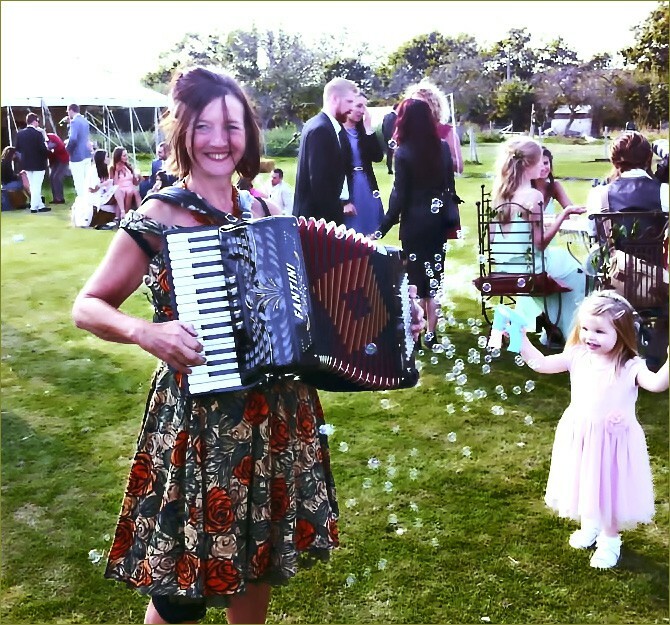 She also teaches the accordion and won the composer’s competition for accordion in 2006 and 2009.